Home Resource Introducing the iOS 12 Launch Party! iOS 12 drops next week! The countdown is over, so it’s time to lift off and rocket to new heights with the raywenderlich.com iOS 12 Launch Party! 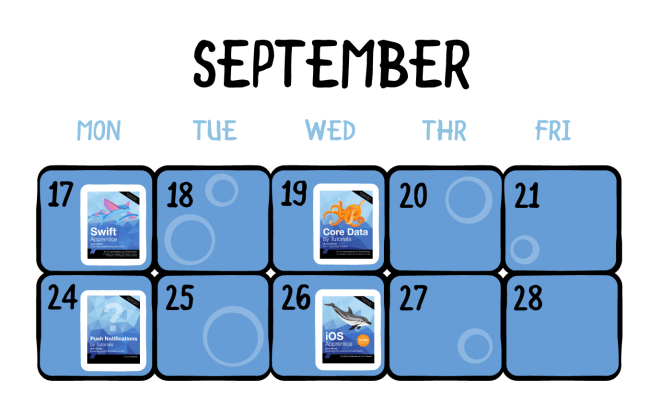 This year marks our eighth annual iOS release celebration. It’s hard to believe we’ve been doing this so many years in a row now — and even harder to believe how far iOS has come from its humble beginnings! Just think — back when many of us first started, there was no ARC, no Storyboards, no ARKit, and most importantly: no Swift! This year, we have an amazing lineup of iOS 12 tutorials, books, and courses — and over $9,000 worth of of giveaways to be awarded to some lucky readers. This year, we have twelve books that are either new or updated for iOS 12. That number worked out well, didn’t it? And to celebrate, we’re putting all iOS 12 books on sale! And as always, any updates to existing books are free for existing digital edition customers, to thank you for supporting our site. 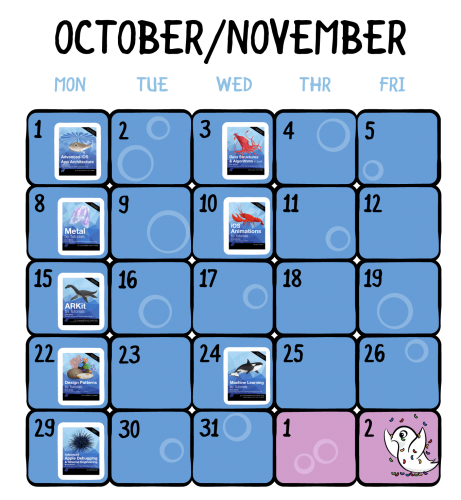 Here’s a detailed look at what’s coming over the weeks to come. We have not one, not two, but three exciting new books for you this season: Machine Learning by Tutorials, Push Notifications by Tutorials, and Advanced iOS App Architecture! We think you’ll really enjoy what we have planned for these books. Read on below to see what’s in store for you! First up, I’d like to introduce our first new book: Machine Learning by Tutorials! With every new version of iOS, Apple has made it easier to add machine learning to your apps. There are now several high-level frameworks, including Natural Language, Speech, and Vision, that provide advanced machine-learning functionality behind simple APIs as part of Apple’s iOS tooling. Want to convert speech to text or text to speech? Want to recognize language or grammatical structure? Want to detect faces in photos or track moving objects in video? These built-in frameworks have got you covered. 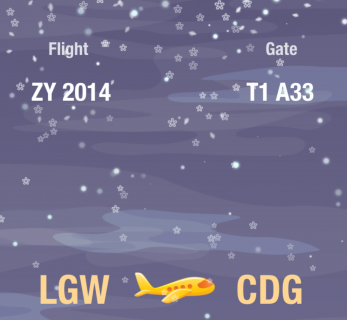 Machine learning: iOS & You: Before getting your hands dirty, you’ll look at machine learning from 10,000 feet. You’ll learn what you can do with machine learning, what concepts such as deep learning mean, and what machine learning means for mobile devices. Image classification: Jump into machine learning by classifying healthy snacks from unhealthy ones, learning learn how to add models to a project and how you can use Core ML for classifying images from your device. You’ll also learn how to perform localization, object detection and segmentation on images. Python & Turi Create: Learn how to set up a Python environment to use the tools of the trade when it comes to creating machine-learning models. You’ll learn how to use Jupyter notebooks and Turi Create to tune and export models for Core ML. You’ll also learn how to use transfer learning to train your model, and how further tuning of parameters and increasing the number of iterations can affect your model. Training with Keras: You’ve seen Create ML and you’ve seen Turi Create, now get ready to meet to Keras. You’ll see how to create your model from scratch using some of the lowest-level APIs available. Sequence classification: Machine learning isn’t limited to just images. You’ll learn how you can take motion events from your device and use machine learning to identify the activity being performed. You’ll also learn how you can use recurrent neural networks (RNNs) to predict the outcome of some event, given a sequence of events. Language classification & transforms: NLP classification has been popularized as a tool that can help categorize large bodies of text, such as identifying spam in your email or identifying related content from websites. You’ll deep dive into training a model for use in a fun NLP classification project. And if you can classify text using NLP classification, you can surely convert text as well, right? You’ll learn the answer to that question by working on an example of how to translate between two languages. Machine learning has been around for a while — but that doesn’t mean you’ve missed the boat. Thanks to the internet and smartphones, there is now more data than ever to feed machine learning, and ever-cheaper computing power to power that learning. Machine learning is now a practical tool for solving real-world problems that were too complex to deal with before. What is new, and why we’ve written this book, is that mobile devices are now powerful enough to run machine-learning algorithms right in the palm of your hand! Matthijs Hollemans is an author on this book. After many years of handcrafting his logic with if-then-else statements, Matthijs finally saw the light and switched to machine learning, teaching computers to come up with those if-then-else statements by themselves. Why write programs when computers can write their own? Matthijs also lifts heavy things in the gym and plays heavy things on his guitar. 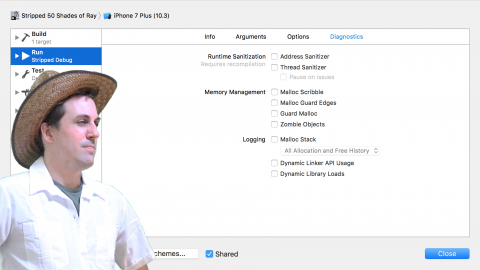 Matthijs blogs about iOS machine learning at http://machinethink.net. You can find him on Twitter as @mhollemans. Audrey Tam is also an author of this book. 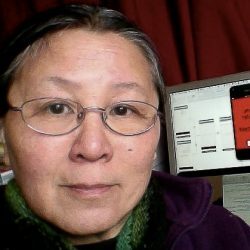 As a retired computer science academic, she’s a technology generalist with expertise in translating new knowledge into learning materials. Audrey has a PhD in applied math, so is especially good at dis-intimidating machine learning math. Audrey now teaches short courses in iOS app development to non-programmers, and attends nearly all Melbourne Cocoaheads monthly meetings. She also enjoys long train journeys, knitting and trekking in the Aussie wilderness. Chris LaPollo is an author of this book. He’s told software what to do for over two decades, but lately he tells software to go figure it out itself. An independent developer and consultant focused on machine learning, he also writes video games for fun. Nowadays he spends free time with family and learning to cook. He’s kept his basil plants alive for several months — it’s a pretty big deal. Find him on Twitter at @ChrisLaPollo. 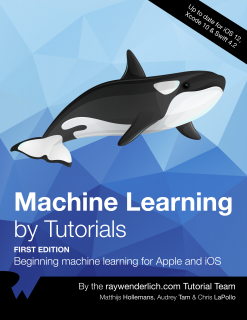 Machine Learning by Tutorials is available today for pre-order for the special launch price of $44.99 during the iOS 12 Launch Party sale! But don’t wait, since the sale ends soon. If you want to get started in the intriguing and expanding field of machine learning, there’s no better time to do it than now! 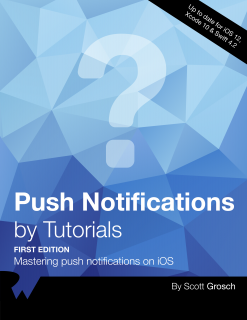 I’m also pleased to introduce our second newest book: Push Notifications by Tutorials! In Push Notifications by Tutorials, you’ll learn everything you need in order to create, send and receive push notifications, meaning notifications that come from an external service as opposed to locally from the device. You’ll also cover how to handle local notifications, as sometimes you don’t need all the overhead of a remote notification, and it’s enough to simply schedule a notification to appear at a specific point in the future or when you enter a specific location. Getting to know push notifications: Before diving in, learn the basics of what a push notification is, what the flow is for delivering them, and what are they useful for. Payloads: A push notification is constructed and delivered based on a payload structure. You’ll dive deep into all of the possible customizations and options to this payload structure. Push notification servers: Learn about Apple Push Notification Service (APNs) — Apple’s service for delivering push notifications. What is a device token, and how do you test sending notifications from your own Mac? Server-side pushes: Delivery of remote push notifications is usually done by a remote server. Learn how to create your very own Vapor-based server to register device tokens and deliver notifications from your own server, as well as some of the optional third-party providers you could use. Handling common scenarios: Learn how to handle common scenarios relating to push notifications such as delivering notifications in the foreground, handling user interactions, silent notification, and pre-fetching content in the background when your notification is delivered to the user. Custom actions: Add custom actions to your notifications and learn how you can leverage these to take your notification interaction to the next level. 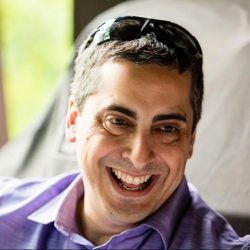 Modifying the payload: Learn how to modify the push notification payload after it actually arrives at the user’s device, letting you manipulate your notifications on-device in an extremely fine-grained way. By the end of this book, you’ll be a master of push notifications and well on your way to implementing them inside your own apps. Since push notifications is such a focused subject, we decided that the book needed to be direct and to-the point; so instead of making you wade through 300 pages of theory before getting down to business, the book gets the job done in just over 150 pages. It’s just the information you need, just when you need it. And a compact book like this needs a compact price to match. Therefore we’ve priced Push Notifications by Tutorials to help you get the job done; the book will be released for the incredible launch price of just $29.99! Push Notifications by Tutorials will be available on September 24, 2018. Finally, the third of our new books this season is one that you’ve been asking about for quite some time: architecting iOS apps! Advanced iOS App Architecture thoroughly explains and demonstrates how to apply popular iOS app architectures, one at a time. 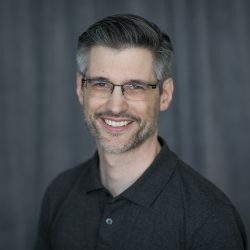 The authors, René Cacheaux and Josh Berlin, have been speaking on architecture for several years now, and they have put all of their passion and knowledge about good iOS architecture into this book. Now, more than ever, it’s very important to understand and apply good software architecture practices in our projects as apps are getting more complex and as development teams are pressured to deliver faster results despite constantly changing requirements. iOS architecture in theory: The first half of the book introduces you to different aspects of iOS app architecture. We recommend reading these chapters before diving into any of the specific architecture chapters to get a good handle on the concepts involved. iOS architecture in practice: The second half of the book explores multiple architectures, one per chapter. Each architecture chapter begins with a little history, followed by a detailed theory walkthrough. 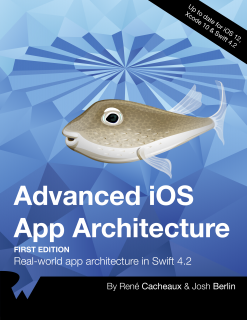 The remainder of each architecture chapter focuses on applying the theory to iOS app development. Each architecture chapter concludes by covering the pros and cons of that architecture. You can read this section in order — or jump straight to the architecture that interests you. It’s your choice! The first early access release of Advanced iOS App Architecture will be available on October 1, 2018. 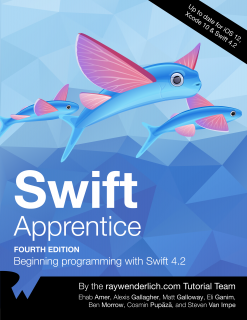 The fourth edition of our popular book, Swift Apprentice, covers programming in Swift 4.2 in a straightforward, easy-to-understand manner, through a sequence of tutorials and hands-on challenges. This book is perfect for complete beginners to Swift or for developers who want to sharpen their Swift chops and make sure they’re using the best new features of the language. You’ll start with the basics like constants, values and types, then move up to more complicated items such as data structures, classes and enumerators, and finish off with some advanced topics like protocol extensions, custom operators and protocol-oriented programming. Swift Apprentice, Fourth Edition, has been fully updated for Swift 4.2 and will be released on September 17, 2018, as a free update to existing digital customers. If you don’t have the book yet, pre-order it now! During the iOS 12 Launch Party sale, you can get the book for only $49.99. Marching right along, we’re pleased to bring you the fifth edition of Core Data by Tutorials! What is Core Data? You’ll hear a variety of answers to this question: It’s a database! It’s SQLite! It’s not a database! And so forth. But here’s the technical answer: Core Data is an object graph management and persistence framework in the OS X and iOS SDKs. Core Data by Tutorials teaches you everything you need to know about Core Data, starting with the basics like setting up your own Core Data Stack and moving all the way to advanced topics like migration, performance, multithreading and more. 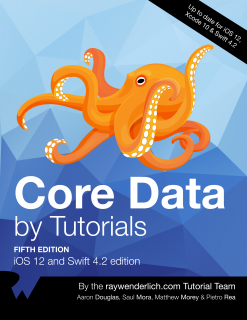 Core Data by Tutorials, Fifth Edition, has been fully updated for iOS 12, Xcode 10 and Swift 4.2, and will be released on September 19, 2018, as a free update to existing digital edition customers. The iOS Apprentice is our best-selling book for complete beginners to iOS development, with over 10,000 copies sold! It has a series of epic-length tutorials that each show you how to build four complete apps from scratch. For this edition, long-time team member Fahim Farook has once again come on board to update Matthijs Hollemans’ classic for Xcode 10, iOS 12 and Swift 4.2. Did you know that iOS Apprentice was first written for iOS 5, and we’ve updated it for every version of iOS since then for free? You can’t beat that value! 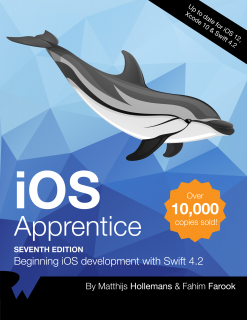 iOS Apprentice, Seventh Edition, will be released on September 26, 2018, as a free update to existing digital edition customers. Data Structures & Algorithms in Swift is one of those “must-have” books for any Swift developer, whether you’re just starting to learn about algorithms, trying to optimize your code, or even preparing for that next whiteboard interview! This book shows you how to implement the most popular and useful data structures using Swift, and when and why you should use one particular data structure or algorithm over another. The set of data structures and algorithms in the book will serve as an excellent foundation for building more complex and special-purpose constructs. The high-level expressiveness of Swift makes it an ideal choice for learning these core concepts without sacrificing performance. 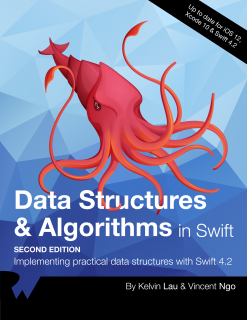 Data Structures & Algorithms in Swift, Second Edition, has been fully updated for Swift 4.2 and Xcode 10, and will be released on October 3, 2018, as a free update to existing digital edition customers. 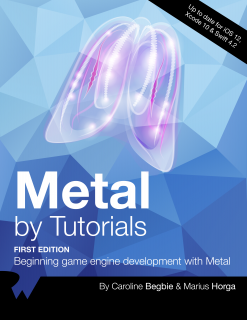 Get ready to build your own low-level game engine in Metal, with the complete first edition of our book Metal by Tutorials! This book will introduce you to graphics programming in Metal — Apple’s framework for programming on the GPU. You’ll build your own game engine in Metal where you can create 3D scenes and build your own 3D games. As you progress through this book, you’ll learn many of the fundamentals that go into making a game engine and gradually put together your own engine. Once your game engine is complete, you’ll be able to put together 3D scenes and program your own simple 3D games. Because you’ll have built your 3D game engine from scratch, you’ll be able to customize every aspect of what you see on your screen. Metal by Tutorials is fully up-to-date for iOS 12, Swift 4.2 and Xcode 10 and will be released on October 8, 2018, as a free update to existing digital edition customers. iOS Animations by Tutorials teaches you how to make delightful animations in your apps with Swift 4.2. You start with basic view and layer animations, move all the way through auto layout animations, view controller transitions, and even investigate 3D animations. When used properly, animations can convey information to your users and draw their attention to important parts of the interface. To create responsive and attractive user interfaces, you’ll need to use all kinds of animations, from very subtle effects, to extremely expressive ones that leap off the screen. By the end of this book, you’ll have worked through the chapter content and you’ll have hands-on experience solving the challenges at the end of the chapters — and you’ll be well on your way to coming up with stunning animations for your own apps! 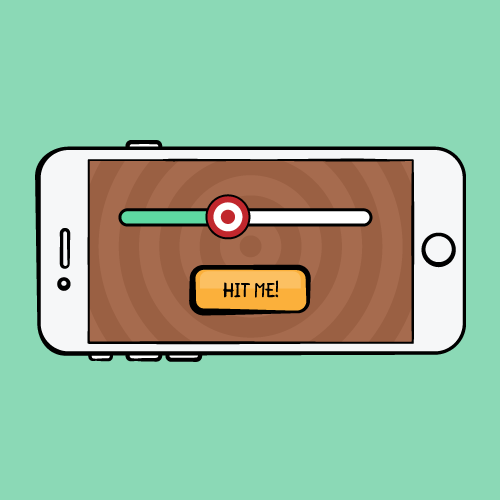 Learn how to create compelling, realistic animations to make your apps stand out! 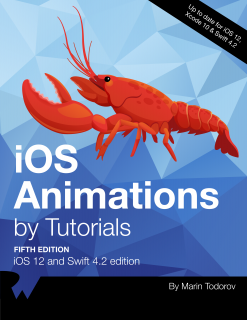 iOS Animations by Tutorials, Fifth Edition, has been fully updated for iOS 12, Swift 4.2 and Xcode 10 and will be released on October 10, 2018, as a free update to existing digital edition customers. Apple continues to feature great-looking AR apps at their keynotes, and along with the announcement in mid-2018 of ARKit 2, it’s clear that Apple is betting big on AR. That’s why we’re excited to announce that our book ARKit by Tutorials, Second Edition, will be updated with all the great new features in ARKit 2! ARDeck: An image-tracking card game. ARDock: Detect a 3D cube in real space. ARSketch: Build an artistic, shared AR experience. ARQuickLook: Showcase AR content in an AR Quick Look view. 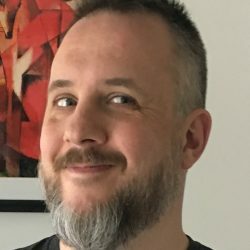 By the end of the book, you’ll have a ton of great experience working inside the ARKit framework, including how to work with 3D objects and textures, how to add game physics, detect placeholders, how to work with face-based AR, how to work with blend shapes, create shared experiences, how the new USDZ file format works, track 3D objects, record your experience with ReplayKit and more! 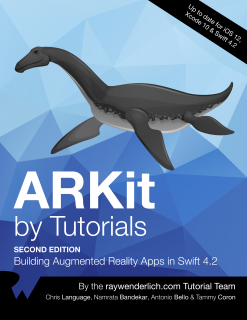 ARKit by Tutorials, Second Edition, has been fully updated for ARKit 2, iOS 12, Swift 4.2 and Xcode 10 and will be released on October 15, 2018, as a free update to existing digital edition customers. Our hands-on introduction to designing robust, extensible apps, Design Patterns by Tutorials, Second Edition, is next up in our iOS 12 Launch Party! For this edition, not only has the book team updated everything for iOS 12 and Swift 4.2, but they’ve also added an entire new chapter on the Coordinator Pattern! Design patterns are reusable, templated solutions to common development problems; they’re not concrete implementations, but, rather, serve as starting points for writing code. They describe generic solutions to problems that many experienced developers have encountered many times before. Each chapter of Design Patterns by Tutorials, Second Edition, offers you a visual diagram of each pattern to make it easy to understand. The authors also give you tips of when to use each pattern and what to watch out for as you develop. 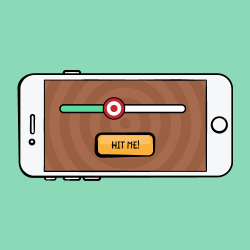 And you’ll work through each pattern with step-by-step tutorials to create a real-world app. Introduction to design patterns: This is a high-level introduction to what design patterns are, why they’re important, and how they will help you. Fundamental design patterns: This section covers essential iOS design patterns. These patterns are frequently used throughout iOS development, and every iOS developer should understand these well. Intermediate design patterns: This section covers design patterns that are also common, but are used less frequently than the fundamental design patterns in the book’s Section II. Many of these patterns work well together, but not all. You’ll create two projects in this section as you explore these intermediate patterns. Advanced design patterns: This section covers design patterns that are very useful but only in rare or specific circumstances. These patterns may be exactly what you need for a particular case, but they may not be useful on every project. However, it’s best to be aware of them as you’ll undoubtedly run across them at some point in your development career. 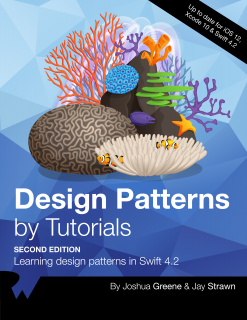 Design Patterns by Tutorials, Second Edition, has been fully updated for iOS 12, Swift 4.2 and Xcode 10 and will be released on October 22, 2018, as a free update to existing digital edition customers. There are always going to be bugs in your software — or any software, for that matter. No amount of test coverage imposed by your product manager is going to fix that. In fact, viewing debugging as simply a process of fixing something that’s broken is actually a poisonous way of thinking that will mentally hinder your analytical abilities. Instead, you should view debugging as a process to better understand a program. It’s a subtle difference but, if you truly believe it, any previous drudgery of debugging simply disappears. Master the secrets of LLDB debugging like a boss! In this book, you’ll come to realize debugging is an enjoyable process to help you better understand software. Not only will you learn to find bugs faster, but you’ll also learn how other developers have solved problems similar to yours. You’ll also learn how to create custom, powerful debugging scripts that will help you quickly find answers to any item that piques your interest, whether it’s in your code — or someone else’s. Watchpoints: You’ve learned how to create breakpoints on executable code; that is, memory that has read and execute permissions. But using only breakpoints leaves out an important component to debugging — you can monitor when the instruction pointer executes an address, but you can’t monitor when memory is being read or written to. Learn how watchpoints solve this problem and how to use them in your debugging adventures. Hello, Mach-O: Mach-O is the file format used for a compiled program running on any of your Apple operating systems. Knowledge of the format is important for both debugging and reverse engineering, since the layout Mach-O defines is applicable to how the executable is stored on disk as well as how the executable is loaded into memory. Knowing which area of memory an instruction is referencing is useful on the reverse engineering side, but there are a number of useful hidden treasures on the debugging front when exploring Mach-O. Learn all about them in this chapter! Mach-O fun: Hopefully, you’re not too burnt out from dumping raw bytes and comparing them to `struct`s in the previous chapter, because here comes the real fun! To hammer in the different Mach-O section types, you’ll build a series of examples across this chapter. You’ll start with a “scanner” that looks for any insecure http: hardcoded strings loaded into the process. After that, you’ll learn how to cheat those silly, gambling or freemium games where you never win the loot. 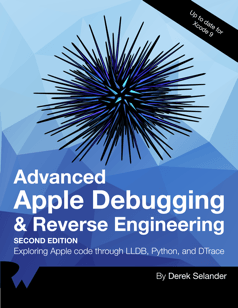 Advanced Apple Debugging & Reverse Engineering, Second Edition, has been fully updated for Xcode 10 and will be released on October 29, 2018, as a free update to existing digital edition customers. As part of the iOS 12 Launch Party, we’ll be sharing some free sample chapters with you from some of the books from this iOS 12 update season. It’s our way of saying “thanks” to you, the readers of this site — and will give you a taste of the all the great stuff contained inside the books this year! In addition to all of the new books, we have tons of new and updated courses coming for raywenderlich.com subscribers! If you’re a raywenderlich.com subscriber, clear your calendars and get ready to learn! Now, the part you’ve all been waiting for: how to get your hands on this year’s prizes! The iOS 12 Launch Party Giveaway is officially underway! A complete set of all our iOS 12 digital edition books — an $800 value! A complete set of all our iOS 12 print books — an $800 value! A one-year subscription to all of our video courses — a $179 value! That’s over $1,700 in value for the Grand Prize! Two readers will win a complete set of all our iOS 12 digital edition books ($800 value). Two readers will win a complete set of all our iOS 12 print books ($800 value). Two readers will win a one-year subscription to our video courses ($179 value). Please note that print versions of our books will be available later this fall. That gives you an impressive number of chances to win — there’s over $9,000 in value of awesome prizes waiting for our lucky readers! To be eligible for for this epic iOS 12 giveaway, all you have to do is leave a comment on this post letting us know which book or course is your favorite on this list — or which upcoming book or course you’re most excited about! 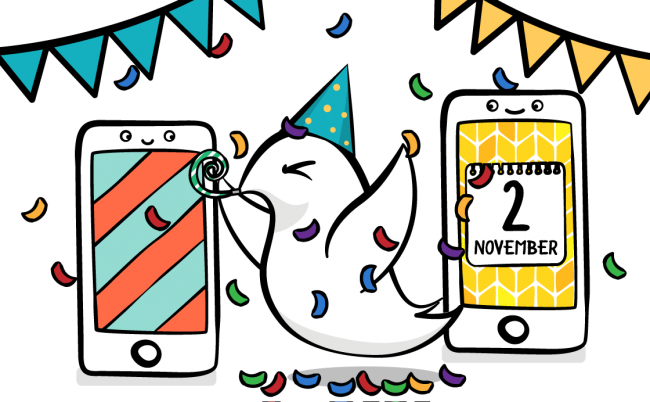 We’ll hold the random drawing in seven weeks on Nov 2, 2018, when the iOS 12 Launch Party finally wraps up! Want to get up-to-speed as fast as possible on iOS 12, Swift 4.2, and Xcode 10? Head over to our official store, where you can get all the books and courses we’ve covered in this update. Want to learn with some great free tutorials? Over the next seven weeks, we’ll release some free sample chapters and videos for you to enjoy! Want to win some amazing raywenderlich.com prizes? Simply leave a comment on this post now — or any of our official iOS 12 Launch Party posts over the next seven weeks for a chance to win! The Tutorial Team and I hope you enjoy the iOS 12 Launch Party! We’re incredibly excited by everything announced at the 2018 Apple Special Event, and we hope you enjoy all the great new books and video courses this season!